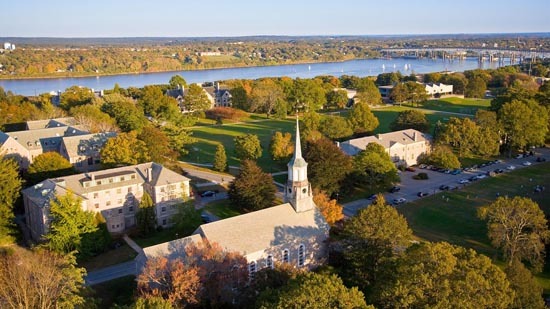 Connecticut College sits with grey stone collegiate buildings atop a leafy hill overlooking the Thames River in New London, Connecticut. 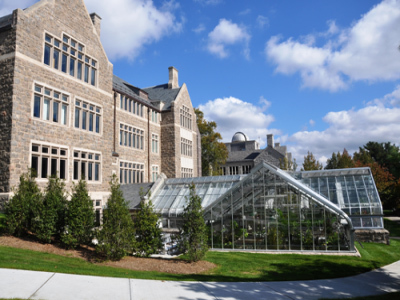 This venerable co-ed liberal arts college was founded in 1911 as the Connecticut College for Women and one of its most distinguished alumnae is Linda Lear, author of the definitive biography of Rachel Carson, Rachel Carson: Witness for Nature. The college maintains the Linda Lear archives with an extensive collection of Rachel Carson materials used by Lear in researching and writing about Carson. So it seemed a natural choice for Connecticut College to invite Carson scholar and President of the Rachel Carson Council, Dr. Robert K. Musil as a guest lecturer and to become the latest campus to join the growing Rachel Carson Council Campus Network (RCCN). Musil was invited and hosted by Dr. Jane Lawson, Director of the Goodwin-Nearing Center for the Environment, a key component of Connecticut College’s extensive commitment to sustainability. The Center was founded in 1993, but its roots go back to the founding of the Connecticut College Arboretum in 1931 and to the Connecticut College Human Ecology Program begun in 1968 as one of the nation’s first environmental studies programs. Given the college’s close connection to Rachel Carson scholarship, RCC President Musil spoke about how Rachel Carson had influenced and inspired modern women environmental writers and advocates in his book, Rachel Carson and Her Sisters: Extraordinary Women Who Have Shaped America’s Environment. Musil described how Terry Tempest Williams, author of Refuge, Finding Beauty in a Broken World, and other works was directly inspired by Carson and shares her anti-nuclear views. Carson opposed nuclear testing from the first American A-bomb tests at Bikini Atoll in 1946, while Williams writes about the devastating effect on her family from living in Utah downwind from open air A-bomb tests in Nevada. Williams, like Carson, also writes about the need to feel for other people and other creatures, including animals such as the endangered prairie dogs she writes about in Finding Beauty. Musil also spoke about Sandra Steingraber, another admirer of Carson, who was a published poet before earning a Ph. D. in biology and tracing the environmental causes of her own bladder cancer in her book Living Downstream: An Ecologist’s Personal Investigation of Cancer and the Environment. Both women share Rachel Carson’s bold advocacy and action with Steingraber leading national anti-fracking efforts and Williams currently buying oil and gas leases in the West so they cannot be developed.